Tension has mounted in the fishing village of Arippu throughout Wednesday as the Sinhala commanding officer of the occupying SL Navy in Arippu and Chilaavaththu'rai vowed to revenge the spontaneous public action on a criminal Sinhala navy person on Tuesday night. The SL Navy person, who entered a household threatening a woman around 9:45 p.m. on Tuesday was caught and beaten up by the villagers. The remaining three members of the four-member squad have managed to escape from the villagers. The squad has been engaged in a series of robberies and misconduct causing injuries to the villagers in recent days. The squad is alleged of stabbing a husband and wife 5 days ago and robbed off gold from another family after putting a knife on the throat of a child 8 days ago, the villagers told TamilNet. The SLN person was caught red-handed on Tuesday and he was in possession of two knives. In the meantime, the occupying Sinhala Navy and Police have almost declared war on the civilians by conspiring together to arrest 60 Tamil men instead of taking disciplinary action on their own intruder and his squad, informed civil sources in Mannaar told TamilNet. Apart from the SL Navy commander vowing to mete out ‘collective punishment’ on the villagers Tuesday night, more than 300-armed SL Navy personnel were roaming the village on Wednesday in Buffel Armoured Personnel Carriers and in military mopeds throughout the day in a threatening manner. Armed SLN, SLA and riot-control police commandos were posted at every 10 feet in the streets of Arippu. “The conduct of the navy person captured by the people has given the impression that he was part of the squad that was engaged in violent episodes throughout the last week and the conduct of the SL government forces after the episode has raised the question whose security it is caring about,” said Mr Antony Benedict Cruz, the Mannaar district coordinator of Fishermen Solidarity Council, when interviewed by TamilNet at Arippu West on Wednesday. 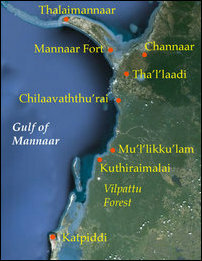 Arippu, situated along Mannaar - Puththa'lam Road is the largest fishing village with Tamil Catholic fishermen in the resettled Musali division of Mannaar district. All the civilians, numbering around 2,550 persons belonging to 610 families from Arippu West and Arippu East remained indoors throughout the day. The SL Police cancelled at the last minute a meeting that had been scheduled between the villagers and the SL Police. 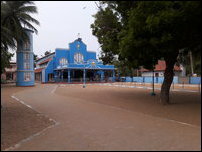 The meeting was supposed to be facilitated by Rev Fr Denis Calistus at St Mary’s Church at 5:00 p.m. The Catholic priests accompanied with NPC Councillor Primus Sirayva and TNA Parliamentarian Charles Nirmalathan calmed down the people and handed over the criminal soldier to the Police with oral guarantees from the Senior Superintend of Police that the Police would be protecting the security of the villagers. 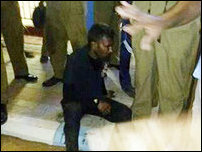 But, Police was conspiring with the SL Navy on Wednesday, eyewitnesses told TamilNet. SL Navy was pushing for the arrest of 60 Tamil men for causing bodily harm to the navy person. The SL Navy has filed a case at Chilaavaththu’rai Police, the sources further said. The menacing ‘soldier’ was carrying two knives under his shirt and the remaining three persons who accompanied him managed to ran away, eyewitnesses told TamilNet on Wednesday. The whole village was scared of roaming SL Navy personnel More than 300 armed SL Navy personnel were deployed in threatening manner as well as around 60 Sinhala police commandos manning every hook and corners of the coastal village. Deploying more than four water-jet gunboats, Tamil fishermen who returned from sea were threatened with arrests. The villagers remained indoors throughout the day awaiting more trouble on Wednesday night. In the meantime, the Sinhala navy deployed four naval vessels in the seas off Chilvaaththu'rai and Arippu in the early hours of Wednesday chasing and harassing the Tamil fishermen, who were on their way back home after fishing. Two fishermen siblings, 41-year-old Visenthy Silvestor, a father of three and Visenthy Sahayanathan Daberara, who is also a father of three were taken away by the SL Navy at the seas and were released only after Wednesday noon. The navy had threatened to frame cases against the fishermen using Prevention of Terrorism Act (PTA) and on false accusation of transporting cannabis, the fishermen in Musali division told TamilNet. The resettled villagers at the coastal fishing village of Arippu has called for an immediate end to the menace caused by the occupying Sinhala Navy sailors entering households while the fishermen go to seas for fishing. The squad of the SL Navy entered the house of 35-year-old Anton Roseman Cruz by breaking the front door of his house around 9:45 p.m. five days ago. When Mr Cruz and his wife confronted the one who was wearing a white mask, the intruder pulled out two knives and caused injuries to them. The neighbours who rushed to help the family spotted another man standing at the door who started to run away after seeing the public. The one who escaped was the SL Navy man who was caught red-handed on Tuesday, eyewitnesses in the village told TamilNet Wednesday. Eight days ago, the intruders robbed off 6 pawns of gold from the family of another villager, Mr Jude, the villagers further said. The intruders were mostly operating in criminal activities between 9:30 and 11:00 p.m. and the villagers reacted spontaneously on Tuesday when they spotted the four-member squad after one of them entered a house and the women at the house started shouting. But, now the entire village is facing a war from the military and police of genocidal Sri Lanka. The priests, NPC councillors and TNA parliamentarians were also not there to assure the security of the villagers on Wednesday. 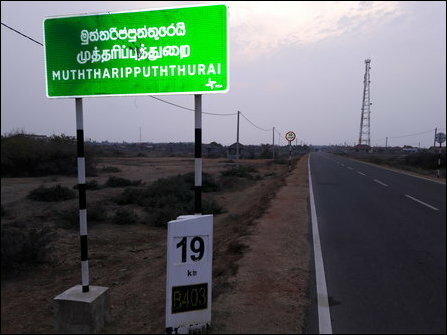 Latest reports say more than 50 families, living closer to Mannaar – Puththa’lam Highway in Arippu East have displaced to Arippu West as the SL Navy was deployed in large numbers along the highway in a threatening manner. Meanwhile, a section of former LTTE members and supporters have been forced to operate as informants to SL Navy in the village under the prevailing conditions of threat, the villagers told TamilNet.